Why do we ask? Because a refrigerant leak is actually one of the most serious problems you can face with your air conditioning system. Not only that, but it is also one of the most common! That is a bad combination, especially when you consider that the symptoms of a refrigerant leak are not always easy to spot or accurately diagnose at first! We’re not here to alarm you, of course. Instead, we just want to make sure that you have some basic information which will help you to deal with any refrigerant leaks successfully. Does that mean that you can fix your own refrigerant leak once you determine that this is what you are most likely dealing with? Absolutely not! Fixing a refrigerant leak is no different than almost any other AC repair in this regard. It’s a job for skilled professionals and skilled professionals only. When you suspect that you need an air conditioning repair in Loveland, CO, be it for a refrigerant leak or any other problem, remember that the pros on our team are always here for you. What function might that be? A pretty important one, in that the entire cooling process hinges on the refrigerant cycle! Specifically, it demands the evaporation and condensing of refrigerant. Your air conditioner has two coils, those being the indoor evaporator coil and the outdoor condenser coil. Refrigerant evaporates in the indoor coil, which allows it to draw heat out of the air passing over it. The warmed refrigerant is pumped through the system to the condenser coil, and its heat is released into the air outside during the condensing phase of the cycle. That cycle continues until desired temperatures are met in your home—which is a much easier goal to reach when you have the right amount of refrigerant in the system. How Can I Spot Trouble? By knowing what to look for. Keep your senses on the alert for any of the following problems in your home. A decrease in cooling output, or even warm air coming from the vents. If you don’t have enough refrigerant in the air conditioning system, then it will struggle to effectively cool air. An increase in cooling costs. If you there isn’t enough refrigerant in the AC system, then it is not going to work as efficiently as it otherwise would. A hissing sound coming from the system. If you have a refrigerant leak in your air conditioner, then you may hear the pressurized gas escaping from its lines in the system. An icy evaporator coil or frost on the refrigerant lines. If you have a refrigerant leak in your air conditioning system, then these components can get too cold and ice up. An irregular cycling pattern. Leaking refrigerant will cause the air conditioner to overheat and may force it to shut down rapidly in an act of self-preservation. Short cycling puts added strain on the system and further drives up energy costs. 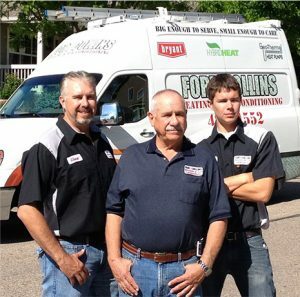 Schedule your AC services with Fort Collins Heating & Air Conditioning. Big enough to serve, small enough to care.